Directly affected by the US Terminal High Altitude Area Defense (THAAD) issue, Chinese tourism to South Korea has been waning since March, and Chinese travelers are also increasingly turning to other options, experts noted. The deployment of the THAAD anti-missile system in South Korea was completed in the morning on Thursday. The THAAD system is intended to protect against the growing threat from North Korea according to the South Korean defense ministry, but the deployment has drawn strong objections from China, with a consequent effect on tourism. Data from the Korea Tourism Organization (KTO) showed that the number of Chinese travelers to South Korea in July was 281,263, down 69.3 percent year-on-year, marking the fifth straight month of plummeting Chinese visitors. 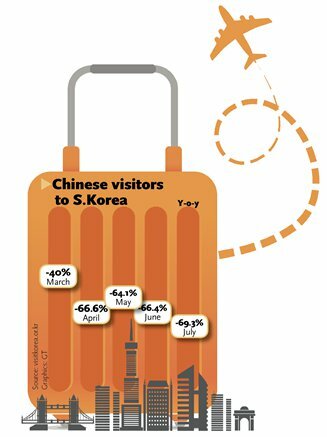 The year-on-year decline in the rate of Chinese visitors to South Korea in March-June ranged from 40 percent to 66 percent per month, according to the KTO. The combined number of Chinese visitors from January to July was 2.53 million, down 46.5 percent compared with the same period in 2016, it said. Since mid-March, group tours to South Korea have been banned in China as part of objections against the installation of THAAD, as the system's radar is considered a serious threat to China's national security. According to the calculations of the South Korean tourist industry, 60 percent of Chinese tourists to South Korea are individual travelers, half of whom usually visit the country through travel agencies, while the other 40 percent have gone with tour groups. Shanghai-based online travel platform lvmama.com told the Global Times on Thursday that all its routes to South Korea have been closed due to the low booking volume. China's CYTS Tours Holding Co and Caissa Tongsheng (Beijing) Investment Co also said they have not provided South Korean tourist products for several months, including visa applications. A Beijing-based female white-collar worker surnamed Liu flew back from Seoul, capital of South Korea, on Wednesday. She told the Global Times that there were many fewer people at the airport and duty free shops than before. In 2016, the combined number of Chinese tourists to South Korea was over 8 million, data from the KTO showed. Most Chinese travelers are attracted by South Korean shopping convenience and reasonable prices as well as the country's popular culture. 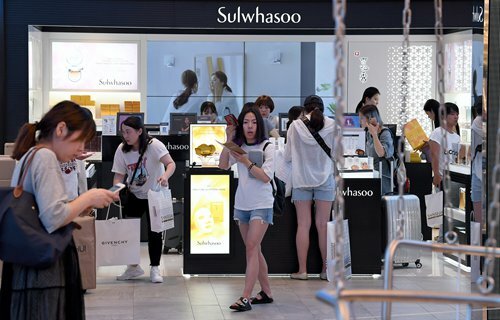 Kevin Lee, a Seoul-based purchaser for Chinese consumers, told the Global Times that his business has fallen over recent months due to lower demand from Chinese people for cosmetics or other fashionable goods. "In addition to the THAAD issue, the weakening South Korean tourism can be attributed to the country's waning soft power in China, which used to be bolstered by the trends surrounding pop stars and TV dramas," Zhang Lingyun, director of the Tourism Development Academy at Beijing Union University, told the Global Times Thursday. "These trends can stimulate tourism but are not sustainable in the long term. Only great products or lasting culture can survive and exist for a long time. In this sense, Japanese tourism has exceeded that of South Korea," Zhang noted. According to an industry report co-released on August 1 by the China Tourism Academy and domestic travel service provider Ctrip, while South Korea witnessed a big drop in Chinese visitors in the first half of this year, Japan rose to second place on the list of Chinese tourists' outbound destinations by number of visits. "In terms of shopping, cultural experience and geographical convenience, Japan represents the most powerful replacement for South Korea," Zhang said. "Chinese consumers' spending power is growing and consumption trends are becoming more mature and rational, but South Korean tourism has not kept up with this shift."